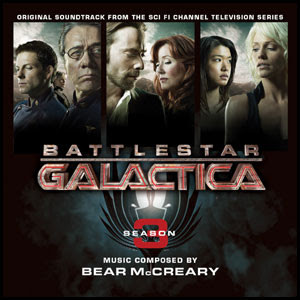 Battlestar Galactica composer Bear McCreary's impressive Season 3 soundtrack album for Battlestar Galactica is out today from La La Land Records. (I will be posting an album review soon.) The Galactica Sitrep recently talked to Bear about his work, his creative process, and how much fun he has scoring the best show on television. Question: First, is there any more new on the BSG concert you have planned for January in Los Angeles? 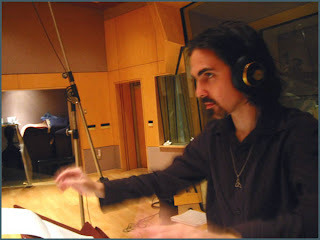 Bear McCreary: I don’t have any new updates as of yet. I’ll be locking down a date in the next few weeks, so look for an update on my website sometime in November. I can say, though, that this concert is going to be even louder and more epic than last year’s. What are your main musical influences for BSG in particular, and/or in general for the genre shows you're working on? My inspiration for each show comes from the show itself. “Battlestar” requires a very organic, earthy texture... To help ground the outlandish settings in a more realistic tone. The upcoming “Terminator” series requires a very cold, synthetic sound... To help bring viewers back into the mythology of the films. And “Eureka” needed an outlandish, over-the-top comedic approach, complete with banjos and accordions... To help push the comedic elements of the story. Even “Eureka”’s darker moments are scored with a sense of whimsy. What is your creative process like? When you are watching a cut and spotting for music, do you start to hear the music you want to do in your mind right away as you watch, or does it evolve over time as you reflect on it before sitting down to write? My creative process begins with spotting each show. I never know what direction we’re going to be headed until I see where the episode is going. And the episodes are usually so good, that they provide great inspiration. What is different or what have you arranged or orchestrated differently, for the cues on the season 3 CD we might notice? (Like in the way that "Black Market" was presented on the CD as compared to its use in the episode.) How is All Along the Watchtower different on the CD than on the show, if it is at all? As with all my CDs, there are subtle differences between what goes on the air and what goes on the CD. Most of the time, it involves editing together several cues into longer suites, which are more enjoyable to listen to than eight 45-second cues. “Watchtower” is essentially the same version as was on the air, except that the long instrumental sections have been trimmed down. These were places where there was dialog or exposition happening in the story. The album version functions much more like a song, and less like a score-piece. Was the Baltar basestar piano music fun to put all together into one piece for the CD? Does that piece lend itself to public performance almost like a chamber music concert? I suppose that piece could be put into a chamber music concert, though it was certainly never intended to be done that way. It was a bit of a task to boil down 45 minutes of piano music into one cohesive 5-minute piece. However, I like the album version much better than any of the individual cues, so it was well worth the effort. Some of my favorite and most informing blog posts you do are about the themes of Battlestar Galactica. What was your approach to scoring Razor? Was the track "Pegasus" on the season 2 soundtrack at all considered as a kind of "theme" for the Pegasus, or does Razor introduce new themes? Well, I considered using “Pegasus” and other themes from that episode... Until I saw “Razor.” The film is actually about a new character, Kendra Shaw, who happens to be involved with Cain and the Pegasus. But it’s not actually ABOUT the Pegasus. So, I ended up writing a new theme for Kendra and developed it thoroughly throughout the score. For season 4 have you composed new character themes and overall are you noticing a different tone in your music for the 4th season than the previous seasons? What new directions, influences, or ethnic instruments from around the world are you thinking of weaving in this season? Season 4 is certainly evolving, as did every other season. It’s too early to say exactly how. I never notice these things as they unfold. Only when a season is over, and I have the chance to step back and look at what I wrote, will I see that the music was evolving. I can say though that the lessons I learned in Season 3 regarding percussion writing will be applied to Season 4. I’m thrilled with the way the drums turned out on the Season 3 album... But in “Razor” they already sound better. Being an accordionist have you had the chance to use a accordion on Battlestar Galactica yet? Yes! Check out “The Dance” on the new Season 3 album. Last season early on you composed music for the dancing celebrations on New Caprica as seen in the flashbacks in Unfinished Business, and you worked with Eddie on selecting songs for use in Joe's Bar in "Taking A Break From All Your Worries" Has there been talk of songs being used this season? That piece you mentioned is actually “The Dance.” Perfect transition! Yes... I have collaborated with one of the screenwriters and one of the stars. I composed an original song that was performed by one of the characters in a pivotal scene which they shot two weeks ago. Well, you certainly guessed correctly about the temp track issue. However, it’s not annoying. It’s the nature of the business. While I personally think that the theme from the The Deer Hunter was a bit too recognizable, the Philip Glass piece played very nicely. Has it been fun to work on Eureka and how is it different that working on BSG? Eureka was a blast! It’s very different from BG, in it’s tone. There’s a sense of lightness and whimsy present, even in the darkest cues. And our ensemble was very different. It was scored with rhythm section, dobro, accordion, guitars and goofball synthesizers. My biggest inspiration for the score were Elmer Bernstein’s score to Ghostbusters and Jerry Goldsmith’s scores to Gremlins II and The ‘burbs. So, it was certainly refreshing coming from the dark and grim nature of the Galactica universe. For the Sarah Connor Chronicles, is the electronic and synthesized score that Brad Fiedel did for the films a kind of touchstone for you on that project? Yes, I’m drawing my inspiration from Fiedel’s score for The Terminator and Terminator 2. You've said, that the Terminator films contributed to your decision to become a film composer, so it must be quite a lot of fun to work in the Terminator universe? Do you have any more up coming film scoring projects coming up? My plate is pretty full with these two series, as well as preparing for two big Halloween concerts at the end of the month and for the Galactica concert in January. So I’m not pursuing anything else right now. Any new solo work, or compositions, such as your compositions for Jenni Scott? I loved writing 3 Pieces for Trio for Jenni Scott. Let’s put a shameless plug for the album I did with her in here. Ok, now that’s out of my system. I don’t have anything in the works at the moment, because writing concert music takes so much time and creative energy. It’s hard to find the time while I’m working in television. But, this is a venue I plan on returning to again in the near future. Thinking back on your college education at USC's Thornton School of Music and working closely with Elmer Bernstein, what were a few of the most important things you learned that have had a practical impact on your work today? There are almost too many to deal with. Probably the most important thing I learned from Elmer was that there are more important things in life than getting ahead in the entertainment business. He really helped me put life in perspective. Do you feel that in all your current projects you have all the creative freedom you need? I am VERY fortunate to have the creative freedom I do. Battlestar, Eureka and Terminator are all produced by very daring and open-minded producers. These are all series that let me expand the music throughout the life of the show. With all this work you're getting, how do you find time to sleep? That is a good question. 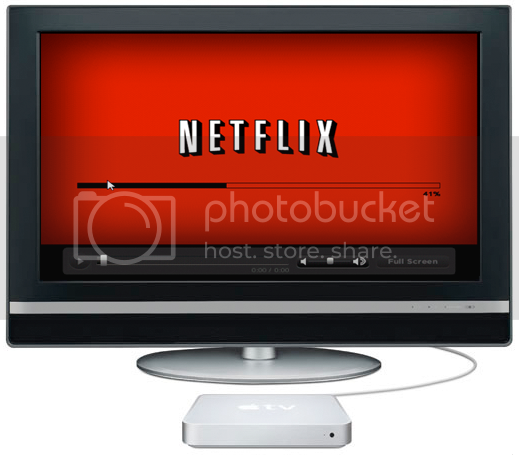 I just looked at the clock and realized that I should probably grab a few hours’ worth. What would you say to encourage people to follow their passions in life, and focus on the kinds of things that drive their ambition, as you've done in your life in building your music career? Do what you enjoy doing. I spent every waking moment in high school and college writing or performing or listening to music. When you just want to relax, and zone out, and take your mind to a different place, what do you put on your iPod? And the opposite to that, is what piece of music do you listen to for a boost of energy, excitement, and for waking up to attack the day? Wow. A couple tough questions! I tend to listen to old film scores for inspiration, and you can pretty much always find Queen, Oingo Boingo or Guns n’ Roses in my playlists. Thanks Bear, for your great answers, we appreciate it. I am just getting my first listen to the OST today - isn't it nifty how Bear used a theme in ep 3.1, the first track on the CD, that showed up again to be mashed up with "Watchtower" for the season finale. Nice stuff. I absolutely love that guy. He's so talented, and kind and... wow. I've listened to the season 3 soundtrack and I love the way each and every single theme he used before has been reinvented to fit the context. The new ones are amazing too. Wow. That's all I can say. There is as much content in this music as in the dialogues themselves. Thanks for this interview, it was much much appreciated. I wish Bear would score my life!!!!!! !